Welcome to beautiful St. John's Wood, a locality within Ashgrove, Brisbane. Enjoy perusing the many facets of this special place. Questions, comments and contributions welcome via the contact tab. "St. John's Wood ...on account of its beauty, has been sold to the best people in the State—people of wealth, repute and undoubted position. This alone will make the name of St. John's Wood a hallmark of distinction and exclusiveness." The St. John's Wood entrance sign has been determined as factually incorrect by the St. John's Wood History Group, and consequently has been removed. The History Group is working collaboratively with Council to arrange a brand new sign that reflects the correct history of the locality. St. John's Wood features in Sunday Mail article! 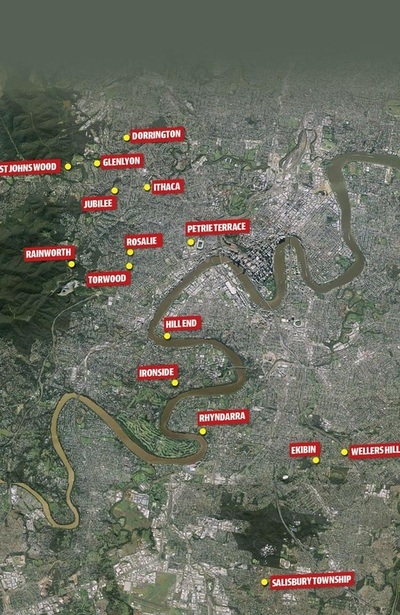 You won’t see them on street signs and they’re hard to find on a map, but homebuyers are flocking to Brisbane’s pocket precincts. Hidden inside suburbs, the historical spots are some of the best-kept secrets of the real estate market and are often known only to those living in the region. Many of the localities were built around former townships and estates that are no longer recognised by the state government, but have their own cafe culture and local identity. Local historian Dr Jack Ford said Brisbane’s suburbs were originally founded around the smaller communities that include precincts such as Ithaca, St. John's Wood, Torwood, and Rosalie. “These areas were the original housing developments that built up and developed corner shops, shopping precincts and their own character,” he said. But Mr Ford said some communities had maintained their separate identities and become pocket precincts within suburbs. Some estates emerged around grand houses, such as Glenlyon and St Johns Wood in Ashgrove. On the southside, the 19th century riverside manor of Rhyndarra turned from grand estate into girls home and then war hospital. Part of the estate was finally sold off in the late ’90s, turning it into a hot pocket precinct. Ashgrove is another area dotted with localities, including St Johns Wood, Dorrington and Jubilee. 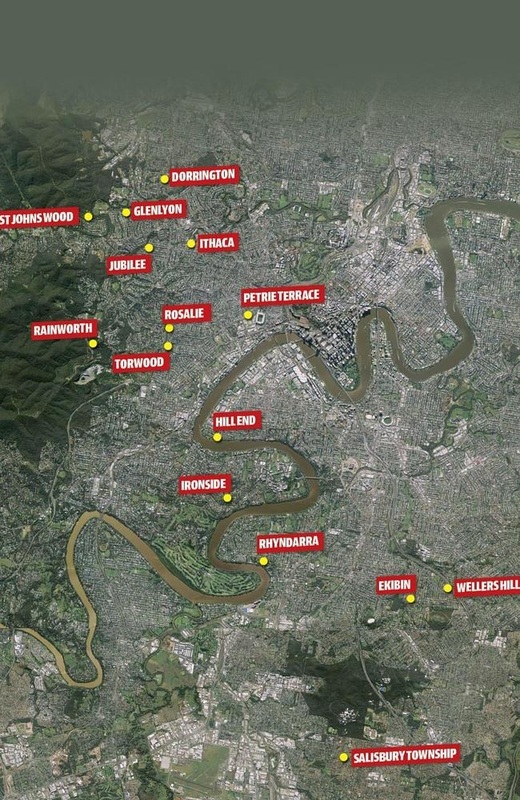 Bardon’s Rainworth pocket is popular, as is Petrie Terrace. On the southside, the Hill End riverside district of West End and Ekibin and Wellers Hill pockets of Tarragindi are also coveted enclaves. St Johns Wood resident Patricia Mackie-Smith said her suburb was a well-kept secret for young families, with a friendly, active community. “Real estate in the area is so tightly held and when a home does come on to the market it often sells very, very fast because the area has such a great reputation,” she said. 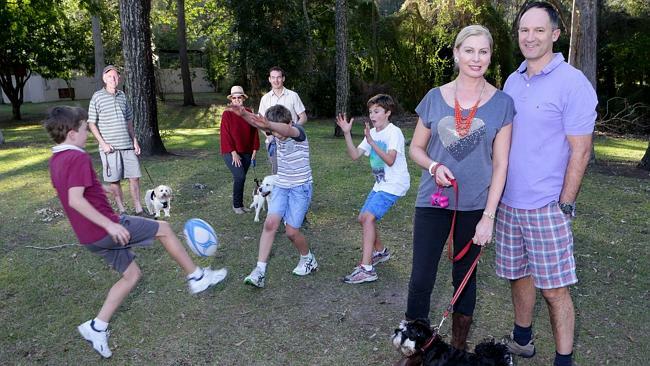 Photo credits: Liam Webb, Ben and Leo Mackie-Smith play footy at St Johns Wood while Ken and Lois McDonald, Ben Webb and Patricia and Andrew Mackie-Smith look on. Pic: Darren England.